The present primary school opened on September 8th. as OLD BATTERSEA R.C. GIRLS‘ & INFANTS’ SCHOOL. It was known to many as a ‘penny school‘ since it had been financed by the ‘pennies’ contributed by the local labouring classes. The first headmistress was one Mary Young ‘Certificated Teacher of the Second Class.’ There is no mention in the records of the number of ‘scholars’ in those early days except that there was a steady increase day by day as new children came along. The school was officially acknowledged by the Government in March 1880 and inspected in 1881. (‘… More attention should be paid to knitting, and the infants should learn recitation.’ …) The Infants‘ department became a separate department in May 1881 under a Certificated teacher. A separate Boys’ department opened on the same site in August 1890 with 55 boys taken mostly from the Infants‘ school, The first head teacher was one John Barry. The school log books make interesting but time-consuming reading which it would be impossible to summarize briefly. The earliest entries record frequent almost daily visits from the Parish Priest and other Managers whose regular ‘testing’ of the registers reflected great concern for roll and attendance figures. September was usually a poor month in this respect because the ‘noppers’ families whose holidays consisted of hop-picking were still working. The school was provisionally taken over by the London County Council in May 1904. The log book entries from this time begin to show clearly the head teachers’ concern with the ‘red tape‘ aspects of their work! The records mention the numerous full-day or half-day holidays which accompanied various events. As well as the various feast days of the Church there were visits by V.I.P.s., examination or sports successes and many royal coronations, weddings, deaths, jubibees, and so on. The last Jubilee mentioned is, of course, the Silver Jubilee of our own Queen Elizabeth, which gained for our children a visit to Battersea Park to see Her Majesty pass through on her ‘southern drive‘. But a pupil at the school in June 1887 would have enjoyed a week’s holiday for Queen Victoria’s Golden Jubilee! The visit to Battersea of the Prince and Princess of Wales gained a half—day holiday, as did the opening of Kingsway and the Aldwych on ‘18 October 1905, or that of Chelsea Bridge in May 1937. There are very many other examples. The logs also recall the visits, in April 1890 and May 1902, of Don Michael Rua (later Blessed Michael Rua), Don Bosco’s successor. The school was closed for two weeks in October 1893 because it was required in connection with the opening of the Sacred Heart Church, Trott Street. Services had been held in the school during the building of this church. If our boys and girls had been pupils at the school in the last‘ week of April 1934 they would have sung a High Mass during one morning and then been guests of the Salesian Congregation for lunch because the celebration was the canonization of Saint John Bosco. Four years later they would have been invited to a great party by Father Tozzi (the Provincial, I believe) in November 1958 to celebrate the Golden Jubilee of the arrival of the first Salesians in Battersea. In September 1939 many children were evacuated to Barley, near Reading, Berkshire. (The following year others went to Dawlish, Devon). They were oilleted with various local families. This was a difficult time: brothers and sisters were often billeted in different houses; there was lack: of local school space (over 100 children in groups in one hall); lack of facilities and equipment (some had to be sent for from Batter-sea); parents who were unconvinced that the whole exercise was in their children’s interests; perhaps most difficult, the hostility and non-cooperation shown by individuals on the local evacuation committee. Gas masks and air-raid drills were the order of the day. The log recalls that pupils were timed as to how quickly they could get themselves under their desks, which for many was the safest place. A few children, noticeably boys, proved to be headaches for their hostesses. One boy decided that he had had enough of being evacuated so he took his money box and went down to the local station to buy a ticket home. However, the booking clerk must have known who he was for he refused to sell the lad a ticket! These years must have been exceedingly difficult for the Boys‘ school headmaster, Michael Donaghy, who epitomized the spirit of many of the wonderful teachers who have taught at Trott Street throughout generations Mr Donaghy came to the school in June 1913. In 1916 he went to serve in the army but returned after the First World War in 1919. In August 1952 he succeeded Mr.Peter who retired after 25 years as headmaster. Mr.Donaghy was to be headmaster until October 1950, having been on the staff for 37 years. In September 1941 Miss Ida Warren, of the Girls‘ department, retired after 43 years of service in the school. Miss Warren had come to Trott Street as a pupil-teacher (in Standard II) in November 1893! Some months after her retirement Mr Donaghy returned to London, and it was at this time that the B0ys‘ and Girls‘ departments were combined under one head teacher. On October 14th. 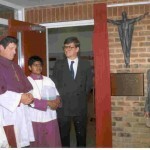 forty boys and girls sung the Mass in Latin to celebrate the Golden Jubilee of the Sacred Heart Church, the opening of which, as was mentioned above, gained their forebears two weeks’ holiday 50 years earlier. There is an entry in the Log Book for 1st. July 1890 and several entries since then alluding to ‘plans of the new school’! Maybe the earliest of these entries referred to some sort of addition to the existing building. But in March 1937 42 years ago! 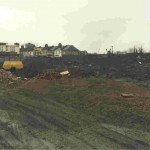 the District Inspector described the school premises as unsuitable. As recently 1973 plans were drawn up for a new school on a site near Shillington Street, Clapham Junction. The site is still there, waiting! The first reference to plans of the new school are to be found in an entry in the log, dated 1 July 1890 — yes! 100 years ago. That was when the school was known as ‘Old Battersea R.C. Girls and Infants School‘ and had been established just 14 years. The school actually pre-dates the Sacred Heart Church in Trott St., which was completed in 1893. For 114 years, the Sacred Heart Infants and Junior Schools were the corner—stone of Catholic primary education in the area a tribute to a succession of patient and dedicated teachers who managed to create and sustain a happy family atmosphere, in sub standard buildings (described, as long ago as March 1937, by a school inspector as “unsuitable”), in the teeth of woefully inadequate facilities and equipment, outside loos which froze in Winter, water pipes which burst and power circuits and heating which failed, regularly. 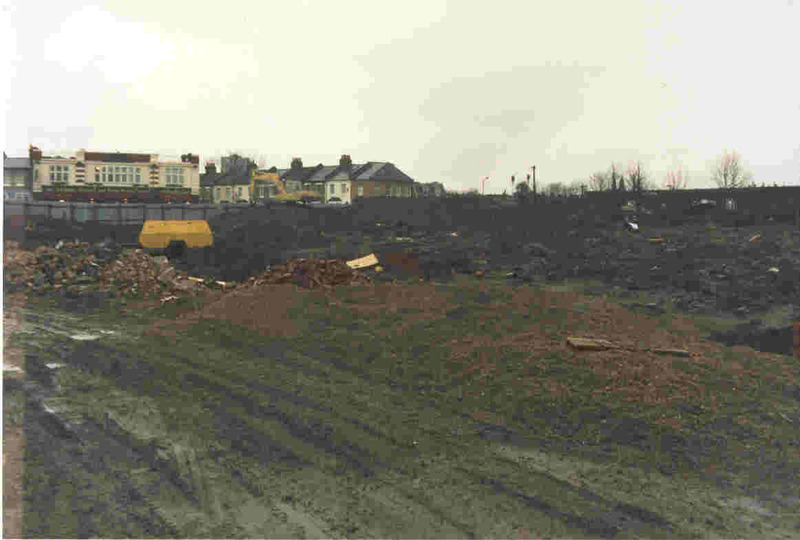 A site was found, in Shillington St., Clapham, and plans drawn up for a new school in 1973. Then the frustration really began, as the Inner London Education Authority and an endless line of Education Secretaries cancelled the project time and time again. But the teachers, parents and governors of the Sacred Heart are nothing if not tenacious, and an impassioned plea to Kenneth Baker finally did the trick. Work began in 1988. 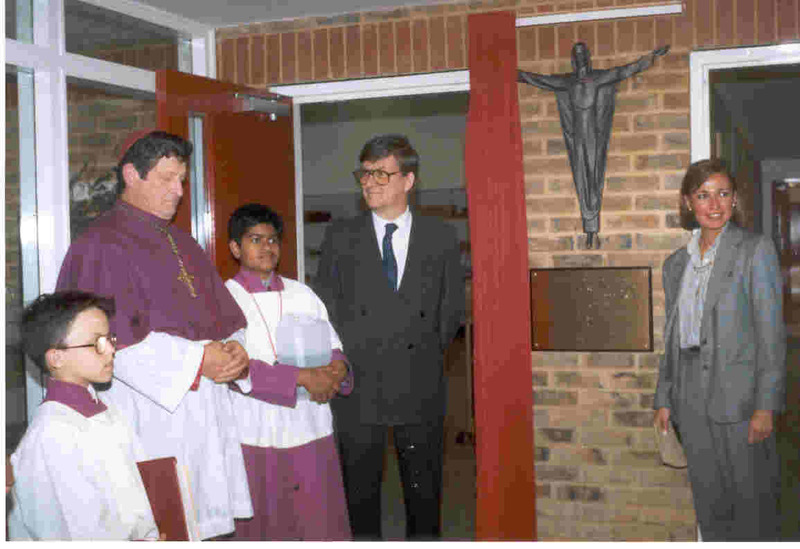 On 14 May, 1990, the Auxiliary Bishop of Southwark, Howard Tripp, performed the opening ceremony – not, it is important to understand, of a new school, but of an old school in a new place. The plaque includes the words “formerly of Trott St.” It was a wonderful day, attended by representatives of the Diocese of Southwark and of the local authority, and by the former constituency MP Alf Dubbs, who had worked hard towards this day, and the present MP, John Bowie. The children had prepared singing and a welcome, and many former teachers were there. (The only hiccup seems to have been that everyone forgot the water which the Bishop needed for the blessing! I am sorry we don’t have a picture of him ladling it out of a gallon container). It has been cleverly designed in a figure of eight, in order to create two distinct parts of the school — for juniors and for infants — with separate identities, whilst at the same time combining into a cohesive whole. Sister Winifred and Mr Harding now function as Joint Headteachers, with no differentiation of policies, and the building reflects the quality and type of education the school offers. What of the dear old buildings? 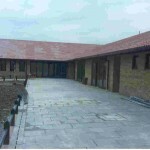 For the moment, they will be available as a centre for parish groups; in the future it is hoped that they can provide a Community Centre for various other local groups, but nothing can be decided until an architect and a surveyor can get a good look, now that it is all empty. Although one or two of the Sisters were a little reluctant to move, fearing that the innate familiarity and heart of the school would be lost in an impersonal new building, for most it is seen as the culmination of a long, hard slog and the dawn of a bright new future. The Sacred Heart School was the last new school to be built by the Inner London Education Authority now defunct. It is heartening to see such a wonderful affirmation of the concept of Church schools coming, as it does, just when considerable ‘opposition to them in principle is being voiced in some quarters.